Holešov (Czech pronunciation: [ˈɦolɛʃof]; German: Holleschau, Hebrew: העלשויא‎) is a town in the Zlín Region, Czech Republic. 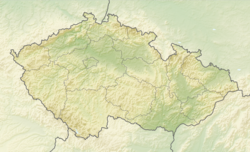 The town is located on the western hillside of the Hostýn Hills - the westernmost part of the Carpathian Mountains. Holešov is well known for its mannerist château with the garden complex. Today, the public airport of regional importance in the south part of Holešov is transformed into the Strategic Industrial Zone, one of the biggest in Czech Republic. Holešov was the birthplace of František Xaver Richter (1709-1789). Established in the place of the neolithic villages, Holešov was mentioned in the first half of 12th century for the first time (the dating varies from 1131 to 1141) as the market village in the ownership of the Bishop of Olomouc. Holešov got some municipal rights in 1322. Traditionally a half of the town with the castle was in the hereditary possession of the nobility, while the other half was administrated by diocese. After 1480, the whole domain of Holešov was owned by nobility. First the House of Sternberg and later several other noble families until 1848, of which the most important was the Styrian Rottal Family, which made Holešov the centre of their domain and rebuilt the old castle into representative palace with the system of gardens (17th - 18th century). After 1848, Holešov became the administrative centre of the Okres (i.e. district) Holešov. Since 1848 the town was officially divided into two parts: the larger Christian town Holešov and in the area of former Jewish ghetto was the smaller Jewish municipality of the same name (Holešov), which had its own administration and contained almost one-third of the town's population. It was only after 1918 when the town was united under one administration. In 1960, the district Holešov was dissolved and Holešov became an ordinary town without any administrative importance. The town was inhabited by a large Jewish community from the first half of the 16th century until World War II, during which nearly the entire Jewish population was murdered. There is a very uncommon Jewish synagogue of the "Polish" type including ornate ironwork and paintings on ceilings and walls using floral and animal motifs. This "Old Synagogue", also known as the "Shakh" or "Šach" Synagogue, was preserved because it looked like an ordinary building from outside. The New Synagogue was destroyed by the Nazis in 1942. ^ "Holešov Industrial Zone (en)". Retrieved 2009-07-02. Wikimedia Commons has media related to Holešov.